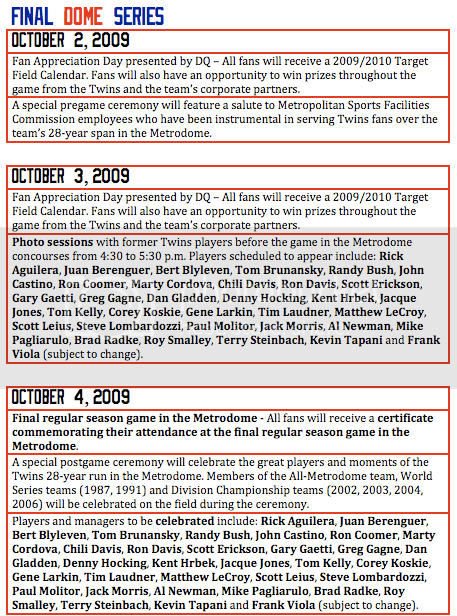 It may not feel close, but with each passing game, the end of an era in Twins Baseball draws near. The Minnesota Twins have 34 games remaining this season, and 17 will come under the roof. Fans looking to be in a seat for the final game in the Metrodome’s baseball history may be out of luck — it has been ruled a sellout with the outfield curtain being pulled up. 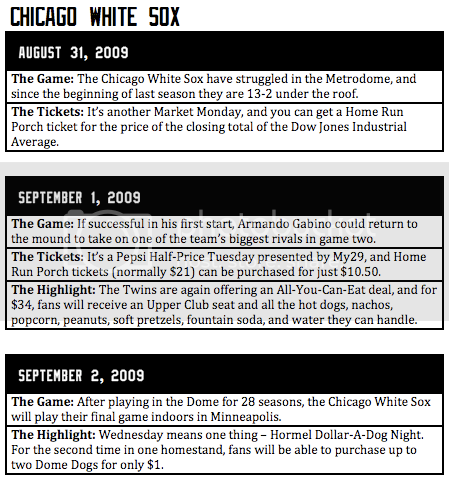 A baseball sellout with no curtain has been considered a crowd of over 55,000 fans; the exact total of tickets sold has not been released. There are still tickets remaining for the other two games of the final Dome series however, which will come against the Kansas City Royals and could potentially be critical to the team’s playoffs hopes. The other games will too provide highlights worth seeing, including appearances by former players, giveaways and more. Entering their three-game series with the Texas Rangers, the Minnesota Twins find themselves one game below .500 with 35 games remaining on the regular season schedule. After acquiring shortstop Orlando Cabrera at the non-waiver trade deadline, the Twins have decided to attempt to bolster their roster for the final month. Neither reliever acquired by the team has a dominant ERA, but both could provide an upgrade in the bullpen to help support Matt Guerrier and Jose Mijares; Rauch could also contribute in 2010, the final year of his deal. After getting off to a slow start with a 9.31 ERA in April, Rauch has drastically improved since with ERA’s of 3.46, 2.08, and 1.86 in the months of May, June and July. Thus far in August Rauch has a 5.00 ERA, but has allowed all runs in two of his nine total outings. Ron Mahay meanwhile has posted solid numbers in half of the months, and less-than-stellar numbers in the other half. Mahay could provide another left-handed option out of the bullpen which could take a load off Mijares. The additions in the bullpen for the Twins might not be the end of the team’s activity. Before the end of the day Monday, the Twins could also add starting pitching. Major league sources have confirmed that the team placed the winning claim on Chicago Cub, Rich Harden. In the second half Harden has posted a tremendous 1.80 ERA and has held hitters to a .151 batting average. The sides have until noon Monday to work out a deal, but it won’t be easy. Projected as a Type A free agent, the Cubs could�receive�two draft picks by holding onto Harden and letting him walk this off-season. While Harden may seem like a�long shot, starter Brad Penny has been called a more feasible option. Reports say the Twins may be willing to pay Penny nearly $1.5 million over the final month which could be enough to put him in Minnesota pinstripes. Whatever might happen in the final 35 games, the front office is making moves and attempting to make the final season in the Metrodome a memorable one. With each passing day the opening of Target Field draws closer. Seats continue to go in around the ballpark, and by the end of fall the ballpark will be ready for testing. Next spring, reportedly on April 12th, the Minnesota Twins will finally take the field to begin a new era in Twins Territory. You can follow the installation live on your computer by watching the Ballpark Webcam. The diagram above shows the field surface at Target Field. The top layer is the Kentucky Blue Grass. 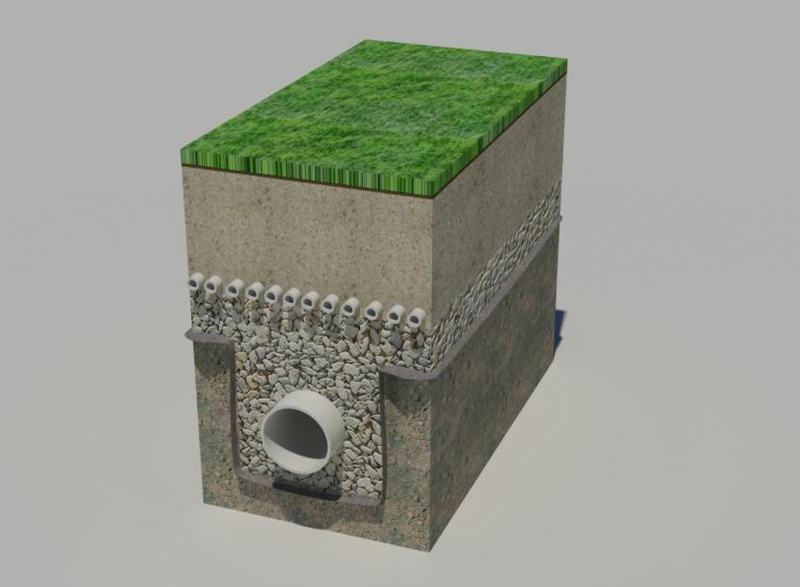 The grass is followed by the sand-based root zone which is 10” deep and is a water storage area. Next comes the field heating tubes which will heat the field in the cold days of spring and fall. A 4” drainage gravel blanket helps further drain water, and the bottom layer is compacted sub-grade which helps support a high quality playing field. The bulk of the playing field is completed, and by week’s end, the final step will be taken. Jason Kubel entering the season had career highs of 20 homeruns and 78 runs batted in. With yet another productive game in the series opener with Cleveland on Friday night, Kubel continued to make progress toward a career year. Kubel currently has 20 homeruns to match his career high, and is only 10 RBI shy of his career high in that category. With 46 games remaining in the season, Kubel finds himself on pace for 29 homeruns, 100 RBI, and quite possibly most impressive, a .312 batting average. The numbers include totals from games where the players have moved into other positions on�occasion, and while Kubel is behind Adam Lind of Toronto in the homerun and RBI departments, he has nearly 80 fewer at-bats. While Kubel has hit five fewer homeruns, he has outdone Cruz in the batting average category by over 40 points and has 10 more RBI. 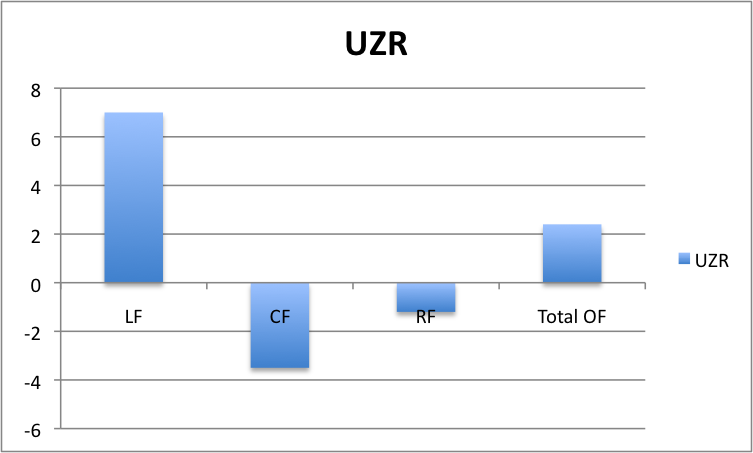 He also has a higher slugging percentage and his on-base percentage is nearly 50 points higher. On pace for career numbers, totals that will place him near the 30/100 mark if correctly projected, Kubel has been one of the league’s best. Nonetheless, he has been lost by the general baseball fans behind superstars Justin Morneau and Joe Mauer. After a week long trip that included stops in Cleveland and Detroit, the Minnesota Twins return home and continue their schedule against American League Central rivals. The week long homestand will include series with the Kansas City Royals and Cleveland Indians. 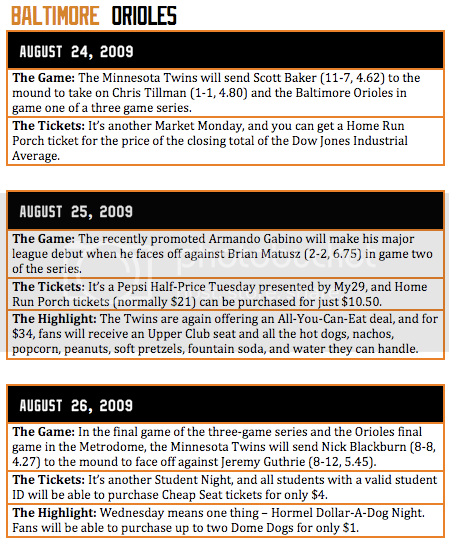 Aside from the on-field highlights ranging from Justin Morneau taking on the Royals, a team he has the most career homeruns against, and Carl Pavano taking on the team that traded him away a week ago, there will be many highlights at the ticket office and Metrodome gates. The Game: The Royals will send righty Kyle Davies (3-8, 6.37) and the Twins will counter with second-year pro, Nick Blackburn (8-6, 3.79). The Tickets: It’s a Pepsi Half-Price Tuesday presented by My29, and you can sit in the Homerun Porch (a $21 ticket) for just $10.50. The Highlight: If you’re going to spend time at the concession stand, you might as well be full doing it. For a $34 ticket, you’ll get not only entry to the game, but you’ll also enjoy all the hot dogs, popcorn, nachos, peanuts, pretzels, fountain pop, and water you can handle. The Game: Brian Bannister (7-8, 3.78) will take on Francisco Liriano (4-11, 5.63). The Tickets: All students with a valid student ID can purchase a Cheap Seats ticket for only $4. The Highlight: It’s another Hormel Dollar-A-Dog Night and all fans (limit two) can buy hot dogs for just $1. The Game: In a daytime matchup, Gil Meche (4-9, 4.50) will return from the disabled list to take on either Anthony Swarzak or Brian Duensing. The Tickets: Presented by KQRS FM, with the purchase of a Homerun Porch Ticket or $5 off a Lower Reserved Ticket, fans will receive a free Dome Dog and soft drink. The Highlight: All kids 14 years under will receive a Library Day Poster presented by Lerner Publishing. The Game: The newly acquired Justin Masterson (3-3, 4.42) will throw between 75 and 80 pitches against Carl Pavano (10-8, 5.09) who will make his second start as a Twin against the team that recently traded him away. The Promotion: It’s a Cub Foods Fantastic Friday, and with the purchase of a Homerun Porch ticket, fans will receive a coupon for a free half-gallon of milk or orange juice from Land O’ Lakes redeemable at a Cub Foods location. The Giveaway: The first 10,000 fans receive a Commemorative Lanyard and Ticket Holder courtesy of MLB2K9. The Game: David Huff (6-6, 6.72) will take on a Twins team that has given him a 10.24 ERA this season. The Twins will likely counter with Scott Baker in the 3:10 CT game. The Highlight: For $37, fans will get a pass to the Tailgate Party presented by Fox Sports North. 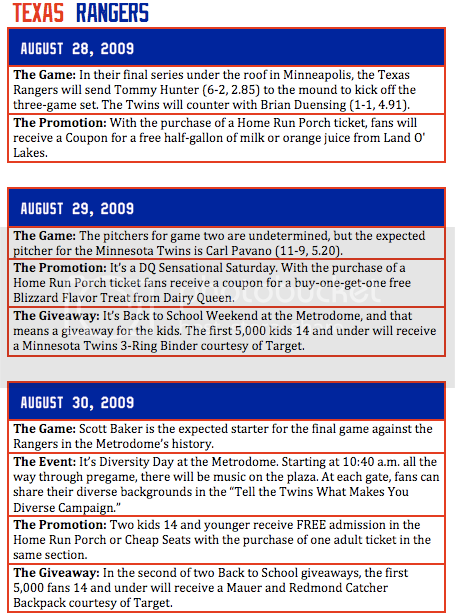 The pass includes entry to the barbeque, a Twins cap, and autographs from Twins’ alumni. The Giveaway: The first 5,000 fans 18 and older will receive a Twins Card Wallet courtesy of Spire. The Game: The Indians pitcher is to be determined, but in the 1:10 CT matchup, the Twins will likely send Nick Blackburn to the hill. The Promotion: It’s Blue Bunny Kids Day, and two kids 14 and under will receive free admission with the purchase of an adult ticket in the Homerun Porch or Cheap Seats. Ride a Bike: All fans who ride their bike to the game, will be able to park their bike for free in a secure bike corral and will receive $5 off a lower reserved or upper club ticket.